BAM! The collaborative art of Bruce and Mike. “Check your ego at the door.” is the driving thought when local artists Bruce Bachelder and Mike Rende set out to create their modestly sized art. The artists each start a painting and then hand it to each other to complete. Sometimes they understand what the original vision for the painting was, but it’s always more interesting when they don’t and something even more unexpected erupts onto the canvas. Influenced by both high and low brow art, their favorite artists include Herge, Jack Kirby, Gustav Klimt, Paul Klee, Henri Matisse, Pablo Picasso Art Spiegelman and Jim Woodring. 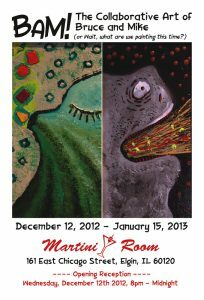 The opening reception will be at the Martini Room on Wednesday, December 12th and will feature roughly 50 pre-framed paintings in a variety of sizes with prices ranging from $20 to $250. Perfect for last minute gift giving if one of them inspires you. For those you you who are local, but can’t make it out to Elgin on a school night, we are also planning to be at the Martini Room on Saturday, 12/15/12. We’ll have some small canvases and plan to paint all night (in front of the live audience). 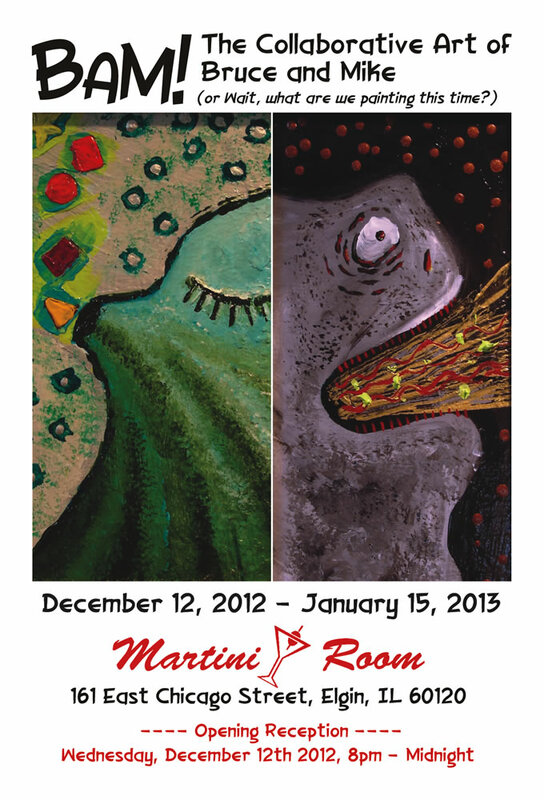 The show runs from 12/12/12 – 1/15/13.